President Vladimir Putin has scrambled thousands of troops and hundreds of warplanes across southwestern Russia for large-scale military drills intended to test the troops’ readiness amid continuing tensions with the West. Shoigu said the manoeuvres will also engage airborne troops and military transport aviation, as well as the navy. He noted that the drills are intended to check the troops’ ability to respond to extremist threats and other challenges. According to Shoigu, who spoke at a meeting with the top military brass, the war games would include redeployment of air force units to advance air bases and bombing runs at shooting ranges. The manoeuvres will test the troops’ mobility, with some being deployed to areas up to 3,000 kilometres (1,860 miles) away, the military said. KOSTROMA REGION, RUSSIA. JANUARY 23, 2016. 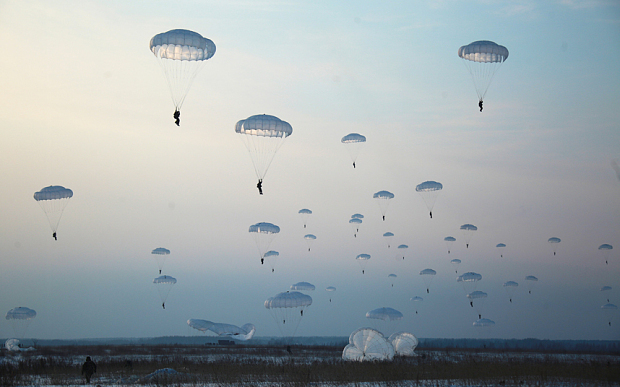 Servicemen of the 98th Guards Airborne Division of the Russian Airborne Troops descending with parachutes during military exercises. 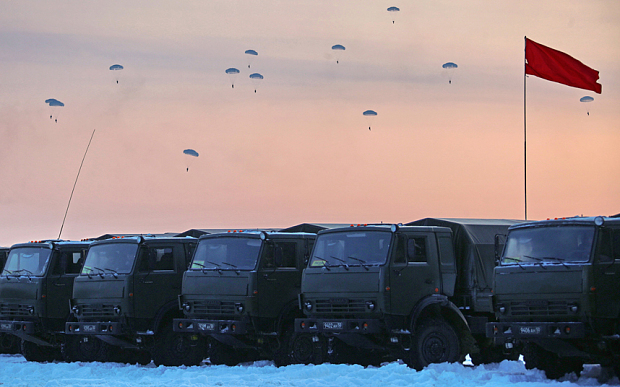 The exercises are the latest in a series of major drills intended to strengthen the military’s readiness. They have continued despite the nation’s economic downturn. Even though a drop in global oil prices has drained the government’s coffers and helped drive the economy into recessions, the Kremlin has continued to spend big on the military, funding the purchase of hundreds of new aircraft, tanks and missiles. ROME – The European Union faces “critical times” and all its members should set aside selfish interests to tackle problems such as immigration and terrorism, the bloc’s six founding nations said on Tuesday. A week after the EU accepted that some members may never go further in sharing sovereignty, as part of the price for keeping Britain in the club, Germany, France, Italy, Belgium, the Netherlands and Luxembourg pledged to pursue “ever closer union” at a meeting in Rome, where they founded the bloc in 1957. The meeting was held against the backdrop of deep division in the 28-nation bloc over how to handle the flows of hundreds of thousands of migrants arriving in Europe fleeing war and failing states in the Middle East and North Africa. It also came a week after Brussels agreed a draft deal with Britain Prime Minister David Cameron that, among other things, reaffirmed the limitations of a treaty commitment to pursue the “ever closer union” of the peoples of Europe, part of a package to help Cameron campaign before a referendum that the EU’s second biggest economy should continue its 43-year membership. Meeting in Italy, which has been in the frontline of a wave of migration to Europe across the Mediterranean, the ministers also stressed the need to overcome divisions on the EU response. Hungary and Austria this week called for fences on the Macedonian and Bulgarian borders with Greece and between Austria and Slovenia, and several states have called into question the Schengen accord on free circulation inside the EU. The statement called for better management of the Union’s external borders in order to make them more secure while preserving Schengen and not hampering freedom of movement. It contained no concrete policy proposals, but said Europe “is successful when we overcome narrow self-interest in the spirit of solidarity”. The Russian Ministry of Defence warned Turkey against launching a military incursion into Syria last week, announcing on Thursday that it had seen “growing signs” that Turkish forces were preparing to intervene to bolster rebel forces battling pro-regime troops in the north. Some experts say, however, that Russian President Vladimir Putin appears to be trying to bait Turkey into entering the Syrian battlefield in order to retaliate for Ankara’s decision to down a Russian warplane in November. 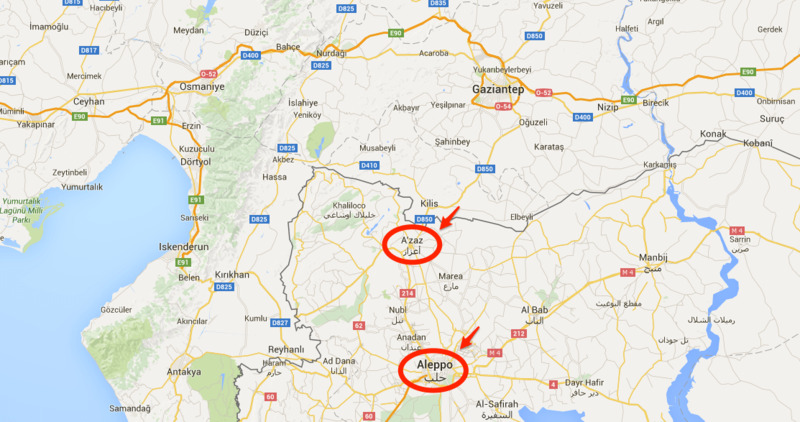 “Russia is trying to draw Turkey into a fight to avenge the downing of its jet. Putin is confident he can win,” retired Brig. Gen. Naim Baburoglu, an adviser to the Ankara-based National Security and Foreign Policy Research Center, told al-Monitor last week. Turkish president Recep Tayyip Erdogan initially denied reports that Turkish forces were preparing to cross the border. But on Sunday, Erdogan signalled that Turkey would be prepared to intervene in Syria if asked by its coalition partners. Erdogan, a staunch opponent of the Russian-backed Syrian President Bashar al-Assad, was at least partly referring to the Syrian Kurds’ sustained expansion westward along the Turkish-Syrian border. That push has largely been facilitated by Russian airstrikes targeting Syrian rebel groups backed by Turkey, the US, and Saudi Arabia. Signs of growing coordination between Moscow and the Kurds came to a head last week when Syria’s main Kurdish militia, the YPG, helped Russia and the Syrian army isolate Azaz — a strategically important city long used by Turkey to funnel aid and supplies to rebels in the city of Aleppo. “I don’t think there is any doubt that the YPG and Russia are coordinating in the Azaz corridor,” Aaron Stein, an expert on Turkish affairs and Senior Fellow at the Atlantic Council, told Business Insider on Monday. As Turkish-Russian relations continue to deteriorate, Russia’s military and political ties to the Kurds are getting stronger. Russia is reportedly looking to open a second air field in the Kurdish-held Syrian city of Qamishli, and the Kurds have said they will open their first “representation office” in Moscow later this week. Fabrice Balanche, a leading expert on Syria and visiting fellow at the Washington Institute, broached the limits of the US’ political support for the Kurds in an analysis last week. “Unlike the United States, Russia does not want to antagonize the Kurds by prohibiting their deeply held goal of territorial unification,” he wrote. That the Kurds are now closer than ever to linking their territories east of the Euphrates with the Kurdish-controlled city of Efrin in the west — a move that would cross Turkey’s “red line” and allow the Kurds to consolidate their de-facto state of Rojava along Turkey’s southern border — may be enough to draw Turkey into the war. “The Turkish army is very conservative and risk averse,” Jeff White, a defence analyst focusing on the security fairs of the Levant at the Washington Institute for Near East Policy, told Business Insider in an email. If the Kurds were to unify their cantons, Turkey might be compelled to intervene to prevent them from forming a statelet along the Turkish border, White noted. And that would be a game-changer. Incidentally, rumours of a Turkish military intervention began circulating days after Saudi Arabia declared that it would be prepared to send ground troops to Syria to fight the Islamic State “if asked” by its allies. This is an excellent article showing that with Russia is moving. It is with Ezekeil 38 we read of dwelling without gates etc –this proposed fence may not be built ! !